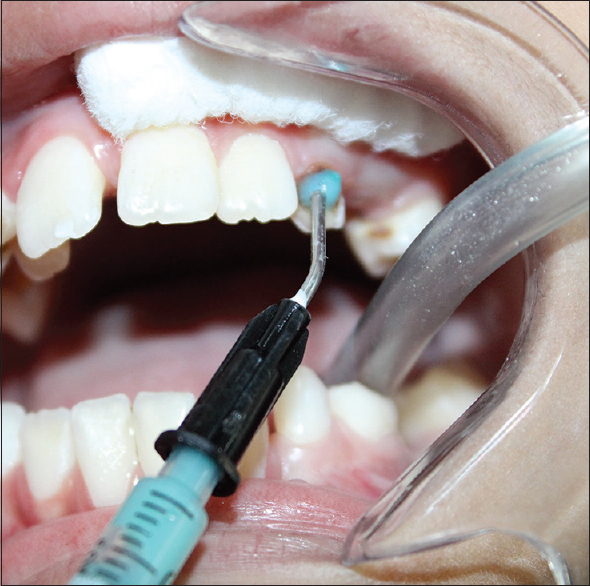 Background: Ultra conservative caries removal now has become an integral part of Minimal Invasive Dentistry. The main objective of deep caries removal is to conserve the tooth structure as well to maintain the integrity of pulpal health. Aim: To evaluate clinically the efficiency of caries removal using Carie-Care compared to the SmartPrep burs for complete caries excavation. Materials and Methods: Split mouth study was done in 64 children where caries excavation was done using Carie-Care on one side and Smart burs on the other side. The parameters assessed were complete caries excavation, pain reaction, need for local anesthesia and mean time required. Results: The differences between complete caries excavation, pain reaction and need for local anesthesia using both the techniques were statistically insignificant. Whereas the time taken for caries removal using Carie-Care was significantly less than Smart burs (P = 0.001). Conclusion: Both the techniques can be used effectively for caries excavation in primary teeth. Thus, the aim of this study was to evaluate clinically the efficiency of caries removal using a new chemomechanical agent (Carie-care) compared to the SmartPrep burs for complete caries excavation including the need for local anesthesia, duration of the treatment, and the pain reaction. Ethical clearance was obtained by institutional review board. Informed consent was obtained from parents or guardians to conduct the study. The study was conducted in the Department of Pedodontics and Preventive Dentistry, Terna Dental College, Nerul, Navi Mumbai. This study was a clinical controlled study (split-mouth) where two methods of caries removal were compared in the same patient. The sample size was selected empirically and not based on any assumptions and statistical calculations. The study included a total of 32 healthy children aged 5-10 years. Each child had two contralateral primary teeth showing comparable open carious lesions. A total of 64 primary teeth were included in this study. Teeth without clinical or radiographic evidence of pulp, furcation, or periapical pathosis. Teeth were divided into two groups according to the method of caries removal. Each group consisted of 32 teeth. Group I: Caries was removed using the Carie-Care (Ecoworks Inc., Bengaluru, Karnataka, India). Group II: Caries was removed using the SmartPrep burs (SS White Burs, Inc., Lakewood, NJ, USA). Caries removal was performed using either of the two methods. Carie-Care (Ecoworks Inc., Bengaluru, Karnataka, India) was applied on the carious lesion according to the manufacturer's instruction for 1 min [Figure 1]. The caries was gently excavated using blunt spoon excavator. Caries detecting dye was applied on the cavity for 10 s. Dye was water washed using three-way syringe. This group consisted of 32 samples. The carious portion of these samples was excavated with the help of SmartPrep bur (SS White Burs, Inc., Lakewood, NJ, USA) at slow speed [Figure 2]. During the excavation procedure, there was no limitation to number of burs used, but the main aim was to remove all the carious portion of dentin. Caries-detector dye "Seek®" (Ultradent product Inc., USA) was applied on the cavity for 10 s and the dye was water washed using three-way syringe [Figure 3] . For each patient, the following was recorded by the same investigator: Pain reaction using sound, eye and motor scale (SEM) according to Wright et al. [Table 1]. It is an objective method for pain assessment where measurement of comfort was taken according to three types of observations; SEM. The level of response for each observation was given a numerical value (score), and these values were averaged to obtain the comfort level [Table 1]. Only the operative time of caries removal excluding time of anesthesia administration. All data were entered into a Microsoft Office Excel (version 2013) in a spreadsheet and checked for errors and discrepancies. Data analysis was done using Windows-based "MedCalc Statistical Software" version 13.3.1 (MedCalc Software bvba, Ostend, Belgium; http://www.medcalc.org; 2014). Mean working time was compared between the groups using unpaired t-test. 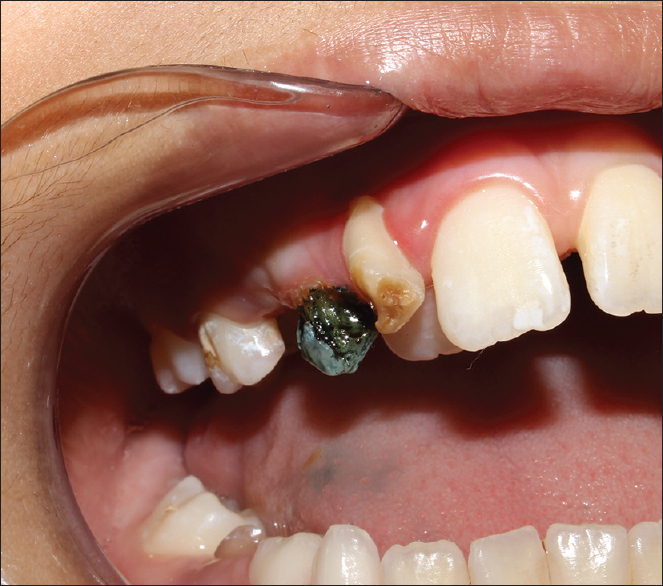 Of 64 teeth, complete caries excavation was observed in 28 (43.75%) and 25 (39.07%) teeth with Carie-care and SmartPrep burs, respectively. The comparison between both groups based on caries excavation was statistically insignificant [Table 2]. In the present study, local anesthesia was required for only one tooth using Carie-care and three teeth using SmartPrep burs. Score 1 was observed in 48.44% with Carie-care and 45.31% with SmartPrep burs. 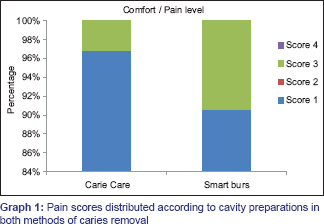 Score 3 was observed only in 1.56% and 4.69% using Carie-care and SmartPrep burs, respectively. Both scores showed statistically insignificant result [Table 3], [Graph 1]. The mean time required for the procedure was longer for SmartPrep burs (7.77 min) as compared to Carie-care (4.53 min). On comparison of mean times between both the groups, the results showed statistically significant difference (P < 0.001) [Table 4]. In the chemomechanical method, partially degraded collagen in carious dentine will be chlorinated by chemomechanical caries removal solutions. This chlorination affected the secondary and/or quaternary structure of collagen by disrupting hydrogen bonding. Carious material removal was thus facilitated. The main advantage of this method is that it does not require complete patient cooperation. Papacarie® (Formula and Acao, Sao Paulo - Brazil) is a chemomechanical caries removal product composed of papain, chloramine, toluidine blue, salts, and a thickening vehicle. It obtains a synergistic action from each of its components that facilitates the removal of the decay with highly antimicrobial properties. Caries-detector dye "Seek®" (Ultradent product Inc., USA) was used to detect remaining caries in samples of this study. "Seek" is a glycol based dye, which stains outer carious dentin and spares affected dentin. It has been shown that dyes that were dispensed in higher molecular weight carriers exhibited reduced diffusion properties in porous tissues. Thus, caries detecting dyes prepared with higher molecular weight polypropylene glycols may prevent over-staining and excessive removal of caries-affected or sound dentin. The reason for increased time consumption with SmartPrep burs in complete caries excavation may be because of changing the burs that abrade when in contact with hard dentin and attachment of another bur to the handpiece. The number of burs used for complete caries excavation in every case of SmartPrep bur group was more than one. Both the techniques: Carie-care and SmartPrep burs can be used effectively for caries excavation in primary teeth. The comfort level and need for local anesthesia using Carie-care were comparable to SmartPrep burs. The working time for caries excavation using SmartPrep burs was more than Carie-care which was statistically significant. Carie-care was cost effective as compared to SmartPrep burs. Sabalaite BR, Juskiene J. Chemomechanical caries removal for children. Stomatologija 2005;7:40-4. Bertassoni LE, Marshall GW. Papain-gel degrades intact nonmineralized type I collagen fibrils. Scanning 2009;31:253-8. Bussadori SK, Castro LC, Galvão AC. Papain gel: A new chemo-mechanical caries removal agent. J Clin Pediatr Dent 2005;30:115-9. Kumar J, Nayak M, Prasad KL, Gupta N. A comparative study of the clinical efficiency of chemomechanical caries removal using Carisolv and Papacarie - A papain gel. Indian J Dent Res 2012;23:697. Beeley JA, Yip HK, Stevenson AG. Chemochemical caries removal: A review of the techniques and latest developments. Br Dent J 2000;188:427-30. Hegde AM, Preethi VC, Shetty A, Shetty S. Clinical evaluation of chemo-mechanical caries removal using Carie-care system among school children. Nitte Univ J Health Sci 2014;4:80-4. Kochhar GK, Srivastava N, Pandit IK, Gugnani N, Gupta M. An evaluation of different caries removal techniques in primary teeth: A comparitive clinical study. J Clin Pediatr Dent 2011;36:5-9. Daniel W, Boston DM. New device for selective dentin caries removal. Quintessence Int 2004;3:40-7. Shakya VK, Chandra A, Tikku AP, Verma P, Yadav RK. A comparative evaluation of dentin caries removal with polymer bur and conventional burs - An in vitro study. Open J Stomatol 2012;2:12-5. Wright GZ, Weinberger SJ, Marti R, Plotzke O. 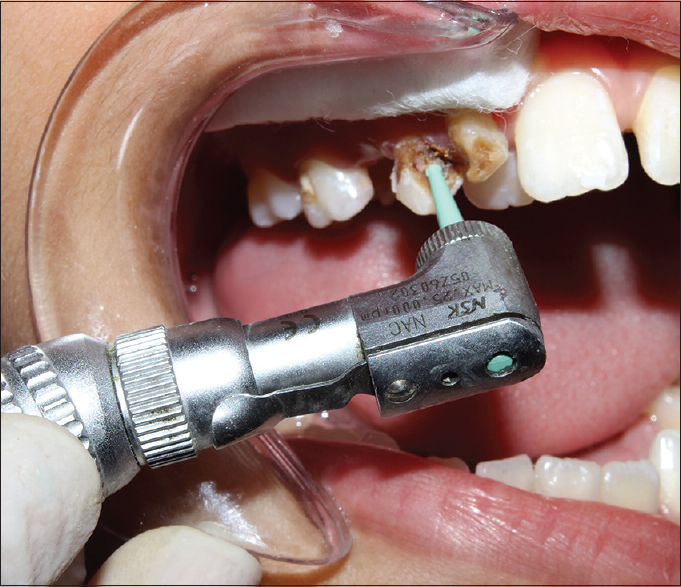 The effectiveness of infiltration anesthesia in the mandibular primary molar region. Pediatr Dent 1991;6:238-42. Kotb RM, Abdella AA, El Kateb MA, Ahmed AM. Clinical evaluation of Papacarie in primary teeth. J Clin Pediatr Dent 2009;34:117-23. Motta LJ, Bussadori SK, Campanelli AP, da Silva AL, Alfaya TA, de Godoy CH, et al. Pain during removal of carious lesions in children: A randomized controlled clinical trial. Int J Dent 2013;2013:896381. Venkataraghavan K, Kush A, Lakshminarayana C, Diwakar L, Ravikumar P, Patil S, et al. Chemomechanical caries removal: A review and study of an indigen-ously developed agent (Carie Care (TM) Gel) in children. J Int Oral Health 2013;5:84-90. Banerjee A, Watson TF, Kidd EA. Dentine caries excavation: A review of current clinical techniques. Br Dent J 2000;188:476-82. Celiberti P, Francescut P, Lussi A. Performance of four dentine excavation methods in deciduous teeth. Caries Res 2006;40:117-23. Isik EE, Olmez A, Akca G, Sultan N. A microbiological assessment of polymer and conventional carbide burs in caries removal. Pediatr Dent 2010;32:316-23. Prabhakar A, Kiran NK. Clinical evaluation of polyamide polymer burs for selective carious dentin removal. J Contemp Dent Pract 2009;10:26-34. Gaddam D, Ghanashyam M, Vasa AA, Vasanthi D, Ramanarayana B, Mynampati P. Evaluation of the efficacy of caries removal using polymer bur, stainless steel bur, Carisolv, Papacarie - An in vitro comparative study J Clin Diagn Res 2015;7:42-6.